Our latest title finally had its first outing on 4 February 2009 at the Modern Works on Paper show in London (see below). You can view the book by clicking on the thumbnail to the left, and this will also take you to the full story in pictures. So it's time to finish the story of its making. The linocuts that we received from the artist Signor Rapp naturally required bringing up to type height, first by securing them to MDF board and then adding further layers to get to the correct height. His line drawings went to a company that photo-etches line blocks that we can print from. In the event we needed six different coloured inks which were made to match the Pantone colours that he specified. In earlier 'drafts' he had proposed working with a small number of quite muted colours in a narrow tonal range, and I was thinking about using a paste paper in matching colours and a suitable cloth for a quarter-cloth binding. A further draft used even fewer colours and I moved to a hand-made flax paper. But when the final illustrations arrived with the colours he wanted, my plans changed yet again and I started working through my collection of paper swatch books for something that would work with the six colours that you can see above. I'm not keen on having a paper like this going round the spine, and this meant a quarter-cloth binding which in turn meant choosing a cloth. I certainly didn't want any more colours involved and have chosen a rather smart grey cloth that sets off the Cave paper. The final decision was about whether the book should be presented in a slip-case. I have to say that although a number of our books in the past have come in slip-cases I don't really like them: I sometimes wonder if they don't do more damage than they prevent, no matter how well they are made. So for Palladio's Homes I have specified a simple folder in the same cloth as the spine. Rather like the case of a case-bound book but without the book block, it wraps around the open end of the book and protects the cloudy sky on the shelf. And opening it is just like opening a window onto the outside world. With everything settled we have finalised the edition size at 170 copies and the price at £250, €300, US$400. (The non-sterling prices reflect the major fall in the pound recently, but if there are further significant currency fluctuations we might have to change them.) Trade discount is one quarter. Postage and packing will be charged as usual at cost. The sheets will shortly go to the binders, so we can now take orders for delivery in late April, we hope. You can contact us via our website, or click here to email us about the book. A paper prospectus will go out soon. Planning has started for the biennial Oxford Fine Press Book Fair in November. I shall be reminding everyone constantly as it approaches, but do put it in your diary now if you are thinking of coming. Contemporary Craft Fair, Bovey Tracey - we shall be there in June. 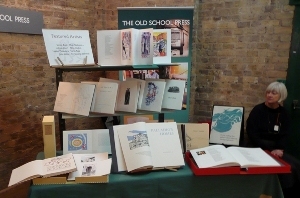 Modern Works on Paper: we attended this show along with eight other makers of books, in its new venue in Covent Garden. It was a great chance to put books in front of new audiences and we had some good sales. Getting away from the show was interesting as the BAFTAs (UK film awards) were winding up next door at the opera house with an appropriate amount of screaming next to the red carpet. We fled.